Yuzuru Hanyu of Japan performs during the men's singles short program at the ISU Grand Prix of Figure Skating in Nagano, Japan, on 27 November 2015. 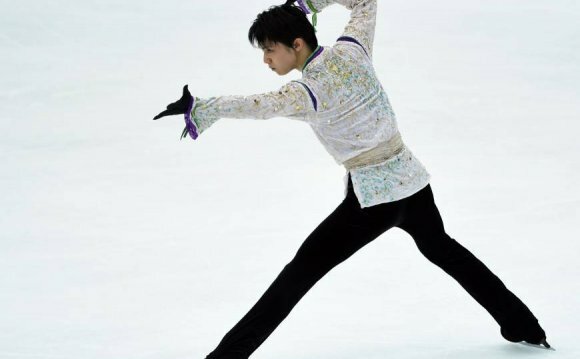 Japan's Olympic figure skating champion Yuzuru Hanyu broke his own world best in the short programme at the NHK Trophy this Friday, posting an eye-popping score of 106.33 points. Chinese Jin Boyang earning 95.64 for a dazzling performance in Nagano did little to scare Hanyu. The Japanese champion responded in style as he nailed every element, including an exquisite quadruple toe-loop, triple toe-loop combination that triggered squeals of joy from his legions of female fans. In doing so, Hanyu eclipsed his own previous high of 101.45 set at the 2014 Sochi Olympics. "You try not to think about your rivals but I saw [Jin's] skate on TV and told myself to get out there and beat his score, " Hanyu told reporters. "I'm surprised and I'm happy but mostly relieved. It shows I've been working on the right things in practice. People might think 'Hanyu is back' but I know I've still got room to improve." Skating to Chopin's Ballad Number One, Hanyu finished with a flourish, striking a matador's pose as the music ended and pumping his fists before being greeted with a hug from coach Brian Orser after putting a disappointing recent runner-up finish in Canada firmly behind him. Victory in Nagano would assure Hanyu's berth at the Grand Prix Final in Barcelona from 10-13 December. Hanyu's countryman Takahito Mura lies third after a score of 88.29 with Russian Maxim Kovtun perhaps fortunate to be fourth with 82.27 after an error-strewn display and crashing to the ice after a fluffed triple axel, ironically while skating to the Genesis song I Can't Dance. In the ladies competition, Japan's Mao Asada suffered a setback as she looked to continue her winning comeback after victory in China earlier this month.The triple world champion fell on a triple axel attempt and finished in fourth after the short skate, behind compatriot Satoko Miyahara and Americans Courtney Hicks and Ashley Wagner.